We at Making A Difference Rescue believe that micro-chipping our animals is a crucial step in our efforts to protect, save and rescue. All animals that we ave and adopt out are micro-chipped to our rescue. We list ourselves as the primary contact in order to ensure their safety, should an adopter move, go on vacation, change phone numbers, etc. This way we can always ensure their safe return and prevent their euthanasia if unclaimed due to unforeseen circumstances. Our animals will forever be an important part of our family, to us, their stories do not end when they have found their forever homes. We are committed to them for their lifetime. Each year millions of pets become lost or displaced. In fact, 1 in 3 pets will go missing sometime in their lives.A microchip is an implantable medical device that safely and permanently identifies your pet. Micro-chips have successfully reunited millions of lost pets with their owners, as well as saving lives when lost pets are impounded at shelters. A Microchip is a passive, integrated transponder that is about the size of a grain of rice (12mm) and is injected into animals with a 12-gauge needle. The microchip is encapsulated in a biocompatible glass capsule coated with Parylene C to prevent tissue irritation and microchip migration. The microchip does not use batteries but is energized by an electromagnetic field produced by a microchip scanner. The microchip is permanent and will last the life of the pet. Each microchip has a unique identification number that is encoded and locked into its integrated circuit. When the pet is registered in a pet recovery database this identification number links the pet to the owner’s contact information. Every year approximately 6 to 8 million pets end up in municipal shelters, animal control facilities and humane societies across the United States (Source: HSUS). Typically, these facilities receive hundreds of lost or displaced pets each week, experience overcrowding and have limited resources. Some of these facilities have a no-kill policy while others have to make hard decisions. Fortunately, most of these facilities are committed to scanning pets upon intake and before disposition and will try to reunite a microchipped pet with its owner. When a microchip is detected, the facility will call a pet recovery service to locate the owner and reunite the pet with them. The system works; each month thousands of lost or displaced pets across the U.S. are reunited with their owners. Many veterinarians and animal control facilities offer microchipping services and host events in their communities. Registering your pet in a pet recovery database is the most important step in the microchipping process. Unfortunately, many pet owners forget or will not take the time or effort to register their pet. When an unregistered pet enters an animal control facility the pet could be adopted by another person or group, or the unthinkable can happen. Because unregistered pets are difficult to trace back to their owners these pets have a limited time to be reunited with their owners. Unclaimed pets take up unnecessary resources and cost taxpayers and donors an average of $120.00 in kennel fees. Remember, a microchipped pet has a better chance at being reunited with its owner but only if the pet is registered in a pet recovery database. Once your microchipped pet is registered, your pet can never leave home without positive identification. Instructions for Updating Avid micro-chips. Call the 24-hour AVID customer service department at 800-336-2843 for the United States or 0800 652 8 977 for the United Kingdom. Press “5” on your keypad to speak with an AVID customer service representative to update an AVID chip. Speak to the customer service representative about what you need to update. Write down any information you receive from the customer service representative for future reference. 1) Read the ingredients; get to know what is going into your pet’s food, especially the first 5 ingredients, because it’s ordered by quantity. If the first ingredient is a carb/grain, put it back on the shelf. It should be a protein (and a real one, not feathers). I would also pass on anything that isn’t clear about the meat. Chicken or chicken meal (which some disagree with, but is actually chicken without the water, so in some foods, it’s more protein) is a great example. If you notice an ingredient that you’re not sure about, hit up Google. So many of us have smart phones, Google while your at the store. If this isn’t possible, as a sales clerk. If they don’t know – pass until you get an answer that you understand. The best example that I have is beet pulp, which I used to think was great for our dogs. It’s beets right? No, apparently it’s the biproduct of processing beets. I don’t want our dogs eating the run off from a manufacturing process. The first ingredient is corn; this is a known allergen for many dogs and corn is a carb – to have a carb as a first ingredient doesn’t seem right to me. It should be a meat. I’m not suggesting that dogs shouldn’t eat carbs, it’s an energy source, but their food shouldn’t be carb heavy and since corn is the first ingredient, I take that to mean there is a high percentage of carbs in this food. Chicken by-product meal; chicken meal isn’t bad, this is just chicken with all the water taken out and some say that it allows the food to hold even more chicken. That’s great! What raises a red flag for me is the “by-product.” What is that? Does that mean it’s all the left overs not fit for other food? The product is the meat; the by-product is what they throw away – or at least that’s what I’m thinking. Uhh oh, we see corn again; corn gluten meal. Wow, this food seriously isn’t for dogs with known corn allergies. Stay away! Rice flour; I underlined this one, because I know that brown rice is great for dogs and I’ve been told that white rice isn’t so great. For dogs with allergies, it’s suggested that wheat flour (of course, some dogs are allergic to wheat) or brown rice flour be substituted for rice flour. I’ve read some great information about grains, thanks to Kate of SlimDoggy (you rock!) and in my reading, rice is seen as the least problematic by some, but it’s still raised often enough to be a concern – but it’s lower on the ingredients list so let’s move on. Beef; why so low on the list? Soy flour; like rice flour, I keep seeing people suggest alternatives, because soy is an allergen for some dogs. Meat and bone meal; whenever food just says meat and doesn’t identify what type of meat, my brain goes to some dark places. I want to know what type of meat. And the veggies are so far down on the list that it seems like they shouldn’t be counted in the ingredients. A protein is the first ingredient and all you see are great stuff for our dogs as you continue to read. I don’t think dry kibble is ideal for my dogs, but I will not start telling people to stop feeding dry kibble to their dogs; instead, I want to encourage them to buy the best they can afford. In my completely biased (raw food, premium dry kibble fan here) and totally inexperienced (I’m not a nutritionist) opinion, I think the first example isn’t great food for our dogs. But that’s just my opinion. Hopefully this gives you an idea of how I look at the ingredients. It’s not overly complicated, because I don’t have time for complicated. Read more about dogs and allergies from Dr. Becker. 2) Bookmark Dog Food Advisor and do a little research. The great thing about this site is that the owner has taken on most of the work – we just need to read his findings. I return to it regularly both as a blogger and a pet mom. You can also check them out on Facebook. 3) Don’t buy from the grocery story or Walmart. Go to local pet food store where they’re going to have truly premium dry kibble; not popular foods they’re calling premium. What I like about local pet food stores is that you can probably speak with the owner and get their input on brands without feeling like your being pushed towards one. I’m not knocking Walmart; I venture in their from time to time for the deals too, but I doubt that their employees can educate me about the pros and cons of the pet foods they carry. 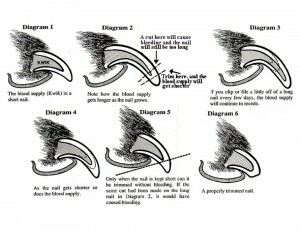 Trimming a dog’s nails makes a lot of people nervous which can make a lot of dogs nervous. For many dogs, having to hold still, have their feet handled and cope with the sensation of nails being clipped wouldn’t be a problem at all if it someone was “pretend clipping” with real clippers every television commercial while they were still little. When my eldest son was little I used to hold him in one arm while shaving with an electric shaver and buzzed it around his head for a pretend shave. At some point before my second son was born I switched to using a razor. His mother, having seen upon occasion a number of blood stained dots of tissues decorating my face for some reason put the kibosh on any further father/son pretend shaving bonding of any kind. In any event, the youngest didn’t get any shaving experience electric or otherwise. A little later in their lives it came time for their first big-boy haircuts and there was a marked difference in their response to the electric clippers. The eldest was fine whereas when it was my youngest’s time and the clippers got close to his head, he got a look on his face like the barber had traded up to a chain saw, bounced out of the chair and headed for the door. Moral: acclimatize, and not surprise. The fear of cutting into the quick and causing some bleeding is the average dog owner’s main concern, so many dogs are sent to the veterinarian or a groomer instead. Truth be told, even there quicks get cut now and then. A big part of the difference between a pro nicking too far and a dog owner is that the pros don’t worry about it. They just slap a little goop designed for just such an event and move on to the next nail. Dog owner’s however can react a little differently and can easily shift their dog’s anxiety level skyward. The dog is laying calmly, paw extended and the owner clips too short, spots some blood and starts yelling something like, “Help! Help! I’ve killed my dog!” and a terrified dog leaps to its feet yelling, “What? What? Somebody’s dead? Hey, whose blood is that?” The poor dog forever after connects the sight of the clippers with either their own imminent demise or the plug being pulled on their owner’s sanity. Even if a dog owner is going to have someone else do the job or it’s a dog that gets so much exercise its nail never need trimming, for two reasons I still recommend they do acclimatization. Firstly, it’s one thing to relieve their own stress by reassigning the job but that doesn’t necessarily lessen the dog’s stress and puppy dress rehearsals will pay off in reduced stress for the dog when the real curtain comes up. Secondly, at some point in its life a dog may get some sort of foot or limb injury that requires daily attention. That’s not a task as easily transferred to a third-party and treatment is easier to apply and easier for the dog to take if a “Stay still ,while I’m doing something you may not like.” foundation has been laid early in life. 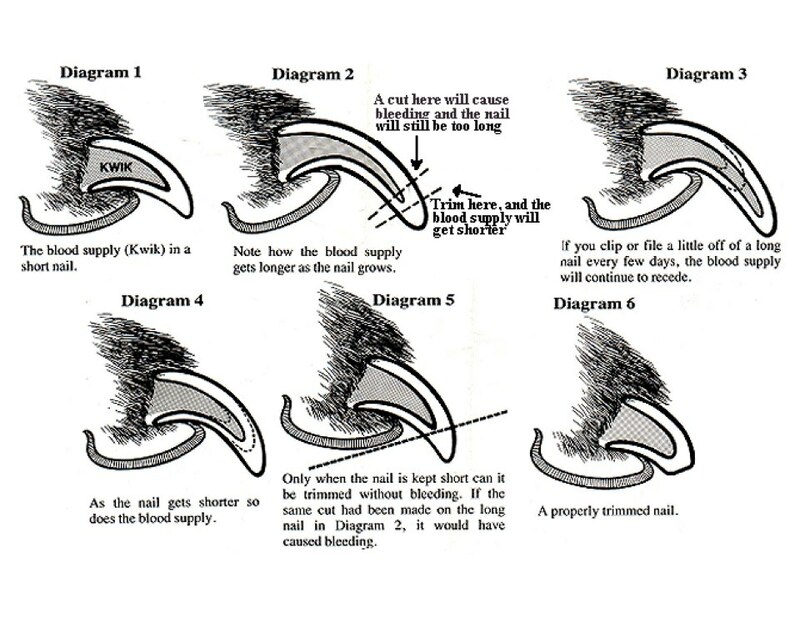 For anyone brave enough to try I have a free nail clipping diagram showing View Of Quick For Nail Clipping and a How To Trim A Dogs Nails With Clippers. Anyone who’s heard it will recognize the dry, hacking, something’s-stuck-in-my-throat cough that won’t quit. It’s the signature symptom of canine infectious tracheobronchitis, also known as Bordetellosis, Bordetella, and most commonly as kennel cough. Whatever you call it, tracheobronchitis is one of the world’s most widespread canine diseases. Like the common cold in humans, tracheobronchitis is highly contagious, rarely fatal, and runs its course in a few days. Fortunately, there are several ways to help make canine patients more comfortable, speed recovery, and prevent future infections. Shelters and kennels are infamous for spreading the viruses and bacteria that can cause “kennel cough.” However, outbreaks are not necessarily due to poor disinfection practices. Stress and crowding can make a dog’s immune system vulnerable to this infection, which is much like the common cold in humans. Tracheobronchitis is called kennel cough because of its association with boarding kennels, animal shelters, veterinary waiting rooms, grooming salons, and other areas where dogs congregate in close quarters. It can strike dogs of any age but is most common in puppies, whose immune systems are still developing, and adult dogs with conditions that impair immune function. Although often referred to as Bordetella, tracheobronchitis isn’t caused by Bordetella bronchiseptica bacteria alone. Several infectious agents contribute to the condition, primarily parainfluenza. Other viruses that may be involved include canine adenovirus, reovirus, and the canine herpes virus. When Bordetella and parainfluenza combine to cause tracheobronchitis, symptoms appear within a week of exposure (usually after three to four days) and continue for about 10 days. Even after symptoms disappear, the recovering patient remains contagious, shedding Bordetella bacteria for up to 14 weeks. In mild cases, infected dogs remain active and alert, with good appetite. In more severe cases, symptoms may progress toward pneumonia and include lethargy, fever, and a loss of appetite. The main symptom of tracheobron-chitis – its cough – has been described as unproductive, throat-clearing, goose-honking, hacking, dry, harsh, gut-wrenching, gagging, wheezing, and croup-like – not to mention annoying to the dogs who can’t stop coughing and the humans they live with. Vigorous exercise triggers it, but even resting dogs may cough every few minutes throughout the day. The cough is caused by irritation and damage to the lining of the trachea and upper bronchi. In the trachea, exposed nerve endings are aggravated by the passage of air over damaged tissue as the dog inhales and exhales. Poorly ventilated, crowded conditions increase the odds of contracting tracheobronchitis, but dogs can catch the disease almost anywhere. All they need is exposure to a dog who has an active infection or is recovering from one – or to the viruses and bacteria an infected dog left behind. Most veterinarians treat tracheobronchitis the way physicians treat the common cold. They let it run its course while keeping the patient comfortable. Some veterinarians routinely prescribe antibiotics, which are effective against bacteria, thus addressing part of the infection. But because antibiotics have no effect on viruses, this treatment is not a cure, and most vets save antibiotics for more serious conditions, such as the secondary infections that sometimes develop in dogs with tracheobronchitis. For partial relief of symptoms and to help the dog feel more comfortable, minor cases are often treated with nonprescription cough remedies such as Robitussin (dextromethorphan). Recommended for chronic, dry, unproductive coughing, Robitussin should not be used for moist or productive coughs. Products that contain acetaminophen or caffeine should not be given to dogs. Prescription cough suppressants and most antibiotics are reserved for cases in which a fever develops, symptoms last longer than a few days, or the cough becomes more severe. Coughs due to tracheal collapse can be triggered by drinking water. Diseases of the larynx or esophagus can cause coughing after eating. A damaged larynx may not close properly, allowing swallowed food to enter the trachea. Paralysis of the larynx is more common in large breed dogs. The cough resulting from tracheobronchitis is usually dry. A moist cough sounds that way because of accumulated fluid in the lungs or airways. The fluid can be water, blood, or pus. Hunting dogs and dogs who spend most of their time outdoors may inhale seeds, pollen, grasses, or other foreign matter that travels through the nose to the lung, causing pyothorax, an infection that produces a large amount of pus. Any dog who doesn’t recover quickly from what appears to be tracheobronchitis should receive a thorough veterinary exam. To help your veterinarian reach an accurate diagnosis, keep track of your dog’s symptoms, noting on a calendar or notebook the date of each symptom and its description. Three years ago, canine flu seemed to be an epidemic affecting dogs of every description (see “Fending Off the Flu,” Whole Dog Journal, December 2005). The cough produced by the canine flu virus is soft and moist, and it’s usually accompanied by a high fever and nasal discharge, none of which are symptoms of tracheobronchitis. Fortunately, of the strategies that help prevent and treat tracheobronchitis work for canine flu as well as other infectious diseases. The herbs, supplements, and treatments described here can help your dog stay healthy when exposed to many different viruses and bacteria. Most boarding facilities require proof of Bordetella vaccination for dogs who will be visiting. However, because there are many strains of Bordetella, and because no vaccine protects every patient, some immunized dogs contract tracheobronchitis despite being vaccinated. Veterinary recommendations range from vaccinating every four months to not at all. No matter what your dog’s vaccination status, a few natural preventives can’t hurt, especially whenever your dog is exposed to dogs with active or recent infections. The single treatment for tracheobronchitis that conventional veterinarians, holistic vets, and caregivers of every description agree on is honey. Honey soothes the throat, but it does far more than that. As noted in “A Honey of a Cure” (September 2007), all honey has disinfecting properties. One of the most expensive honeys sold in the United States and around the world is manuka honey from New Zealand, where bees harvest nectar from the manuka bush (Leptospermum scoparium). Twenty years of research at the University of Waikato show that manuka honey has impressive antibacterial, antimicrobial, antiviral, antiseptic, anti-inflammatory, and antifungal properties. While all honeys share these properties, they are especially pronounced in manuka honey. Most dogs enjoy honey’s sweet taste, so it’s easy to feed from a spoon or, if the honey is thick, you can roll it into a treat-sized ball. Honey can be fed by itself, mixed with powdered herbs for additional benefit, or added to herbal teas that double as cough syrups. Honey and coconut oil work well together. Combine these two infection fighters for both the treatment and prevention of tracheobronchitis and other contagious diseases. Licorice (Glycyrrhiza glabra or G. uralensis) is a favorite of herbalist Juliette de Bairacli Levy. In her book, The Complete Herbal Handbook for the Dog and Cat, which describes her “Natural Rearing” approach to pet care, Levy recommends making a strong infusion (steeped tea) by combining 1 tablespoon dried licorice root with 2 cups cold water, bringing it to a boil, removing it from heat, and letting it stand until room temperature. Add 1 teaspoon honey to each tablespoon of licorice tea and give 2 tablespoons to the dog before meals. Small dogs and puppies can take less and large dogs more, but precise measurements aren’t necessary. Refrigerate leftover tea for up to five days. Kennel-Koff, an herbal product from Amber Technology, contains infection-fighting olive leaf (Olea Europaea), mustard seed (Brassica spp. ), black seed (Nigella sativa), and pau d’arco (Tabebuia impetiginosa). Described as an antimicrobial that aids upper respiratory infections, Kennel-Koff is given orally four times per day for up to 10 days. The recommended dose for most dogs, based on weight, is 15 drops at a time. According to the manufacturer, this product is designed to stimulate immunity, rid the lungs of congestion, kill viruses and bacteria, soothe digestion, rid the body of free radicals, and protect pets who are exposed to illness. Australian herbalist Robert McDowell’s favorite treatment for tracheobronchitis is a blend of rosehips, garlic (Allium sativum), fenugreek (Trigonella fornum), marshmallow, elecampane, coltsfoot (Tussilago farfara), kelp (Laminaria digitata), yarrow (Achillea millefolium), and mullein (Verbascum thapsus), which he makes in a base of apple cider vinegar. Faith Thanas’ Doberman, Sasha, was a Katrina dog. After being shipped in a van with about 20 other rescued dogs, she developed a severe cough. Thanas, an aromatherapist, developed Cough Drop! to treat Sasha’s cough. These are commonsense precautions. But your dog’s best defense against infection is a strong immune system, which you can boost with nutrition, exercise, and supplements like those mentioned here. And if your dog ever contracts a respiratory infection, you’ll know how to use simple remedies to turn it around in record time. CJ Puotinen is a frequent Whole Dog Journal contributor and freelance writer living in New York. She is also the author of The Encyclopedia of Natural Pet Care and many books on holistic health care and herbal remedies for humans. See “Resources,” page 24, for information on her books. The first ingredient in your dog’s food should be a specified meat. Not a meat by-product, but the real thing. Puppies and adult dogs were not meant to eat corn and wheat. If the first ingredient in your dog food is a corn, wheat, meat by-product, bone meal or anything but a real specified type of meat, steer clear. By-products are the leftovers, such as the eyes, hooves, skin, feathers and feet, that are not good for human consumption (unless the dog food specifically states otherwise.) Beware of ingredients that do not list exactly what it is, such as words like “animal” and “meat” as opposed to “chicken,” “beef,” “duck,” etc. See Rendered Products in Dog Food. Using chicken as an example, when a dog food lists a meat in the ingredients such as “chicken” it is going by the weight in the meat’s raw state, before it was cooked. Chicken in its raw state weighs about 80% more than it does once it is cooked and processed into a dry pellet. Once it is processed you are left with only 20% of the actual meat. The word “meal” in an ingredient is something that was weighed after the water was taken out. For example “chicken meal” is chicken which is weighed after it has been cooked and the water has already been taken out, giving you more meat and protein per weight volume. Corn can also cause many issues. Dogs were not meant to eat corn or other grains. Corn has been linked to skin allergies, joint swelling and bloat in dogs, among other things. See Corn in Dog Food. Really? Take a look at your dog’s teeth. Notice that he does not have any grinding molars. They are all ripping canines. This tells us that dogs were not meant to eat grains, as they lack the teeth to grind them up. Dogs have pointy canines for ripping into meat. A lot of dogs develop skin problems and other health issues, including bloat, due to the grains they are being fed in their dog food. It is best to feed dogs a grain-free diet. While the better quality dog food may cost more, the dog can eat less of it since their bodies use more of what they are eating, producing less waste. Not to mention the vet bill if your dog develops issues from consuming a low quality food. Be sure to read the ingredients label of the dog food you are using. You may have trouble finding a good quality food at a grocery store and may have to go to your local pet store to find a higher grade food. A poor diet can also cause a dog to shed more, have a dull coat and have body odor. Below is a daily basic feeding guide for puppies and adult dogs. An individual dog’s requirements may differ from this chart. It is best to consult with your vet about the specific needs of your pet. Puppies should not be separated from their mother before they are 8 weeks old. Puppies that leave their mothers sooner have a rougher time adjusting and a higher incidence of illnesses. I do not know if it is due to weakened immunity or mourning the premature loss of their family. Their mother’s milk provides them with the nutrition and antibodies they need to become healthy dogs. At three to four weeks, puppies should begin eating some solid food. You can try mixing three parts food with one part water or puppy replacement milk. This will make the food easier for the puppy to digest. If your puppy begins eating a little solid food before it leave its mother it will have an easier time adjusting when you bring it home. One way to tell if a puppy is ready to come home with you is if it prefers human company over its mom or siblings. Feed your puppy 3-4 times a day. Puppies have different nutritional needs than adult dogs. Choose a puppy food that provides the appropriate balance of nutrients your puppy needs. Be sure it is getting the right amount of protein and calcium, and the proper amount of calories. Check the label to determine if you are feeding your puppy a balanced diet. A specified meat should be the first ingredient on the label. Feed your puppy twice a day. Your puppy will be teething. He may become a finicky eater or lose his appetite. Keep feeding him nutritious food twice a day. If he has an upset stomach for more than one or two days, take him to the veterinarian. Your puppy may look all grown up but he is still a puppy. He should still be fed a highquality food for the added nutrition. Note, in some very high quality foods the company does not make a separate food for puppies because the food is of such a high quality that it provides for both puppy and adult equally. For example, a real human grade chicken is what it is for all ages. If you are feeding a puppy food ask your veterinarian when you should switch to adult food. Make sure the adult food you switch to is still a balanced high quality diet with the first ingredient being a specified meat that is not a by-product. Feeding should be twice a day. In most breeds feeding should be twice a day. Below is the daily basic feeding guide for adult dogs. An individual dog’s requirements may differ from this chart. It is best to look at the directions of the food you are feeding for their recommendations. This chart is a general reference. The feeding directions are based on using an 8 oz. measuring cup. Puppies can be fed up to one time the highest amount listed in their category. It is sometimes best to split the amount into two or more separate feedings rather than just one big meal, often twice a day. Puppies should be fed more often than adult dogs. When adding in canned food, cut the dry by up to half the amount and substitute the same volume that you cut with canned food, so the dog is getting the same amount of food, some dry and some wet. Note, if you are feeding a good quality dog food you will be able to feed less as the dog’s body will utilize more and poop out less. If you are feeding a food that contains a lot of fillers (grain fillers such as corn are often used by some companies) you may have to feed more in order for the dog to get the proper amount of protein. Dogs should be fed at the same time every day. Feeding at the same time will keep your dog on a bathroom schedule. Ask your vet how many times a day you should feed your dog. Feed your dog the same type and brand of food every day. Unlike humans, a dog’s digestive system cannot handle changes in food. It can cause upset stomach and diarrhea. When switching to a new food gradually transition him to the new food by mixing portions of both foods until you slowly phase out the old food. Your dog may experience diarrhea if his food is suddenly changed. If you are mixing water into dry food you should mix 4 parts dry food to 1 part water. Keep fresh drinking water available at all times. Change the water at least once a day, more for dogs who drool. Follow the guidelines on the dog food package for recommended feeding amounts. Monitor your dog’s weight and activity level, and make feeding adjustments as necessary. If your dog has loose stool feeding sweet potatoes is a natural stool hardener. Unlike some medicines, giving too many will not make them constipated. They sell sweet potato chips for dogs in a lot of pet supply stores. Dogs have about 1,700 taste buds. Humans have about 9000 taste buds, and cats have about 470. Dogs have water taste buds, something humans do not have. Dogs do not crave salt the way humans do. The Henry family lives on 18 acres in Sheridan, and their dog Dakota loved to roam that land. He never left the property until March 1, and he has not been seen since. For most people, a dog or any pet that goes missing is like losing a member of the family. Many times the owner does not even know where to start looking. The day Dakota went missing, his owner, Debbie Henry, was sick with the flu. Her husband, Ed, had left their property to move hay, which he does on a regular basis. Debbie Henry suspects that Dakota followed her husband Ed off the property, but they don’t know what happened after that. Dakota is a 120-pound Great Pyrenese. He was not wearing a collar because Debbie Henry said he would often get the collar caught on the brush on their property and she was concerned he would be injured. He was scheduled to be microchipped at the end of May. Like Debbie Henry, Leah Bergeson’s dog, Toby, was not wearing any identification when he went missing. Bergeson said Toby was at the groomer, managed to maneuver himself out of the harness and ran out of the front door. Toby is a 1-year-old Yorkshire terrier that weighs about 8 pounds. Both owners are offering no-questions-asked rewards. Liz Bagley, owner of Making a Difference Rescue, said the best place to start is on the phone. “I would suggest that (owners) call the animal controls and the rescues,” she said. And, they cannot do it just once. Many times, when someone finds a lost pet they will keep them for a couple of days before turning them in to a rescue or similar facility. But, she said, if you leave your information with the shelters and rescues, sometimes the beloved pet will end up at the rescue later. Such was the case for a dog named D.O.G., who was reunited with his owner, Michelle Linder, of Crest Hill, in January. Linder had taken all the right steps, calling not only area rescues, humane societies and animal control facilities, but also calling the local newspaper and hanging fliers around town. Both the Henry family and Bergeson have done the same in hopes of finding Dakota and Toby. Many times, dogs that go missing do so from a fenced-in yard. Since it is spring, dog owners should check for loose boards in fences or holes under the fences dogs might have dug, Bagley said. When dogs are outside, be sure to check on them. And if you happen to find a pet wandering around your neighborhood, do not assume it is a stray. Sometimes people will find a dog and think that the owners didn’t want it anymore and keep it, Bagley said. Instead, those who find an animal should take the same steps as one who has lost one. They should call area rescues, animal control and humane societies. If possible, they should go to a local vet to see if the pet has a microchip. And they should advertise that they have found a pet. When people call to claim a pet, the finder should be careful, Bagley cautions. She suggests asking the person if they have a photo of their pet before giving too detailed a description of the found animal. Anyone who has seen a large, white dog is urged to call Debbie or Ed Henry at (815) 695-5288 or (630) 514-4051. If you’ve seen a stray Yorkie, contact Bergeson at (630) 340-7263. Veterinarian Dr. Cesar Agustin told Don and Donna Huhnke he was fairly sure Angel was someone’s pet. He guessed she either got out or was stolen from someone’s yard and was used as bait in a dog fight. So, how do you keep your beloved canine safe and out of the hands of someone who would do it harm?  Train your dog to come when it is called. That makes it less likely for him to get away from you.  Keep in mind if you choose to use an extendable leash, you do not have as much control as you do if use a set length leash. When your dog is 20 feet away from you, having a leash may give a false sense of security.  While invisible fences might keep your dog in your yard, they will not keep other dogs or people out.  If you install a standard fence, make sure there is no space between the bottom of the fence and the ground.  Make sure the fence gate has a lock.  Have your pet microchipped. If your pet does get out and his collar falls off, there is no real way to identify him. Almost all animal control, rescue and humane society agencies check for microchips.  If you need to find a home for your pet, go to the person’s home. Do not simply let them come to your home to pick up your pet. Those who intend harm for your pet or are looking for bait for a dog fight could simply act like they want to adopt your animal.